Automation Devices, Inc. (ADI) has forty-plus employees who know the specific needs of our customers. This can take the form of special handling on orders or invoices, special parts we may keep stocked on the shelf, unique packaging, etc. Engineering specifications, quotations, and CAD drawings emanate from our engineering group almost daily. Each order is evaluated and parts feeding and orienting equipment is fine-tuned by parts feeder specialists. Competitors can copy our products and still not effectively compete against us, for they lack one important ingredient - our people! Our people build and tune feeders and fabricate and tool bowls daily. Although infrequent, it may happen that you receive a "No Bid" from our PEECO division on orienting a specific part. You can be assured that every option has been looked at and that we feel marginal feeder operation may be the end result. At Automation Devices, we always strive to build in reliability and quality. Marginal operation is not an option. When you indicate an interest in a custom tooled vibratory feeding system for orienting a specific part, our representatives or factory personnel will first consult with you to put together a specification. Based on that data, we will then submit a formal quote and it will be up to the customer to make the build or buy decision. ADI employees are always on the lookout for better and more practical ways to document the manufacturing of tooled feeder systems through high-resolution photos, CAD drawings, and instructional text. A detailed inspection report accompanies each tooled feeder system and includes a listing of organized data relating to the operation and maintenance of the feeder system. The report includes control settings, operating levels, air pressure settings, and actual part feeding rates. If your decision is to buy, then both engineering and manufacturing collectively finalize the method of feeding and orienting prior to the job being released to manufacturing. When the finished product passes final inspection and meets the customer's requirements, it is documented and shipped. We encourage our customers to come to Automation Devices to inspect their feeders. This is a very practical method of final inspection as both the bowl builder and the end user are together to evaluate the performance of the overall feeding system. Often, small changes can be incorporated at that point to provide a more fail-safe operation or to improve performance and overall reliability. Automation Devices is committed to bringing new vibratory feeder bowl technology to the marketplace. In our earlier years, our product offering was simply cast aluminum bowls. In today's market, we offer a product mix of both cast aluminum bowls and fabricated stainless steel feeder bowls in both straight wall and cascade designs. Our experience with the fabrication of feeder bowls allows us to now produce many of the earlier cast aluminum feeder bowl styles in stainless steel. 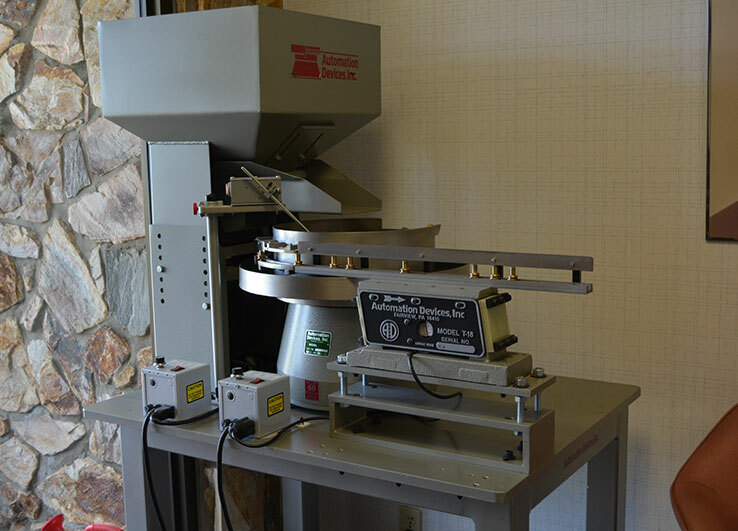 Automation Devices is committed to building quality vibratory feeding system products. ISO 9001:2015 registered, ADI is able to provide an unrivaled level of assurance that a capable, responsible, and knowledgeable company stands behind the products you choose.